Hello to all my friends, hope you are having some fun this summer and staying cool out there. I’ve been have a good time taking my mom for hikes and swims up in the cooler pines of Flagstaff. In her place we welcome Eric Holowacz as our new Executive Director. Woofs and paws up to you Eric! I’ve already included you in my circle of friends and taught you where that magic tin of treats is located. Okay, so now you have the most important part of the job under control. Everything else is a piece of cake! As we wander our way to the end of summer – ‘Dog days of summer’ as some two-legged critters call it… don’t quite understand that one…. I’m looking forward to the fall festivities. In September we have the Co-Op Show for artists to set up and sell their work. October brings all those amazing Plein Air artists to town. This is also my favorite time of year. 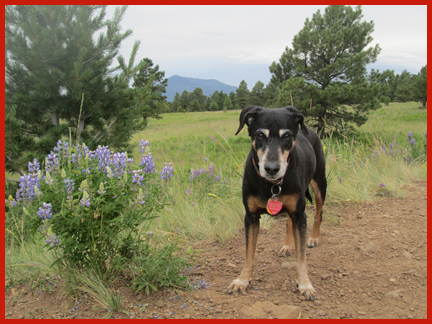 Cooler weather, pretty colors, get a little hiking in, hang out on the front porch – Ahhh, the life of a pampered pooch. So my friends, see you soon. Stay cool out there!